This Bourjois eyeliner is a novelty. It came in drugstores (Müller) three days ago. I decided to buy it because it supposed to provide precise, straight line and eraser in case you make an uneven line. So I wanted to try it out, to see how promising the product is. 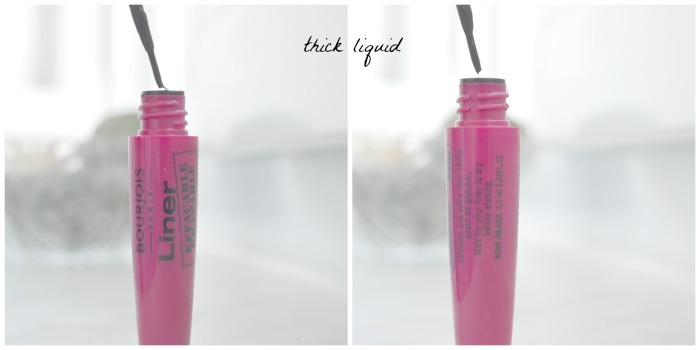 The brush is thin enough to make a straight line and the liquid inside is dense which makes it perfect to apply. 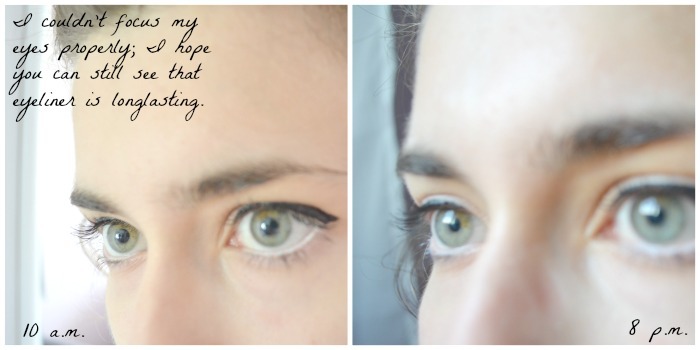 Eyeliner dries quickly and that is also one of the benefits- you don’t need to worry about smudging. It says on packaging it lasts 16 hours and I wanted to try that as well. I can easily says it lasts a very long time. I had it on for an entire day to see the results. No smudging, no creasing. That left me with one more feature to try- eraser. 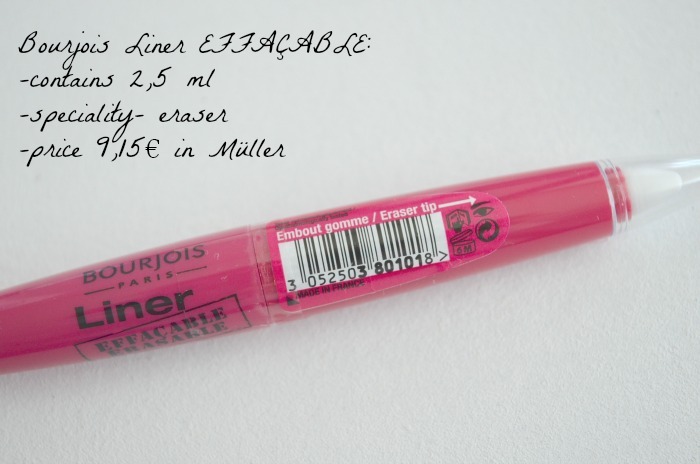 It says you need to wait for eyeliner to dry before erasing- that’s true, otherwise you’ll ruin the line. Anyways, it works just fine. 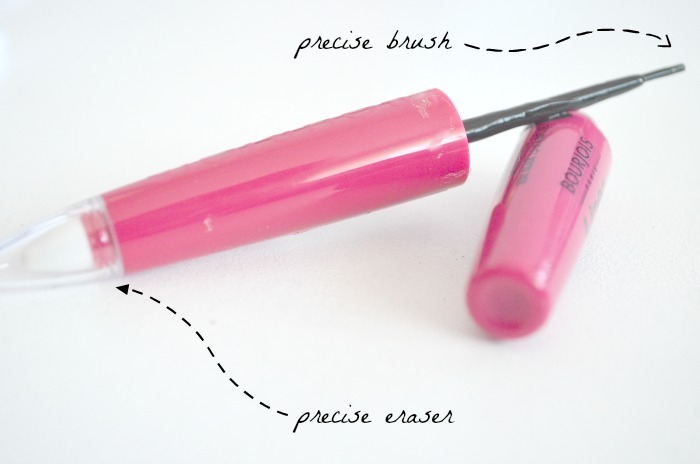 The shape of an eraser makes correcting accurately. However, there is one downside- you need to press a bit harder. I corrected the end of the line and I wouldn’t use that pressure on my eyelids. I want to know if any of you used it already and what are your thoughts on it? I’ll be gone for the weekend, but I will see you soon. *Remove word verification for comments. Sounds like a great product! I love the packaging and the results! Wow it has an eraser?! How inventive! You have pretty eyes! 🙂 and thanks for sharing this information! I have trouble looking for the perfect eyeliner! Sure we can follow each other on GFC and blog lovin', following you now! nice review and beautiful blog. Lost my blog after following each other! Thankfully managed to find yours again. Acertainlovelyblog.blogspot.com is the new one! The eyeliner looks great. Wish I could find Bourjois in the U.S. still. I don't think they sell it here anymore. Now following you! Check out my blog when you have a chance. 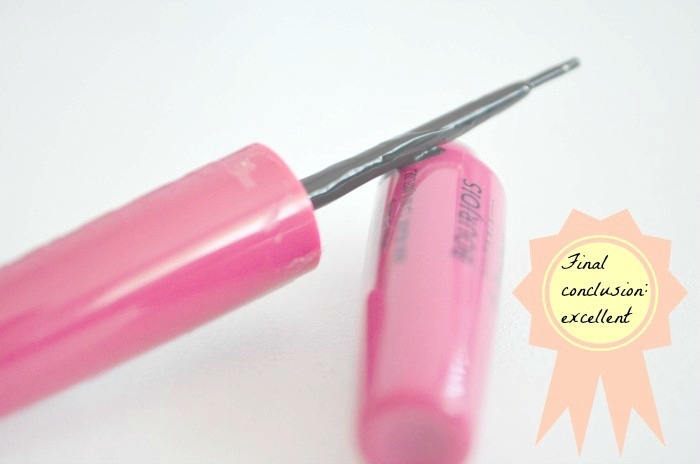 great tips,i love eyeliners and i use to buy Bourjois product when i used to live in Paris but i don't seem to find it here in Canada. this eyeliner is amazing !! !